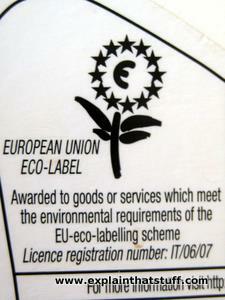 Eco-labeling schemes - What are they and how do they work? Which one should I buy? That's the question that probably buzzes through your head every few seconds as you trail through the grocery store. Lots of people like to shop with at least one eye on the planet, though ethical shopping isn't easy. Many products seem to be "natural" or "eco-friendly"—they might have labels covered in flowers, fields, animals, or trees—without offering any real evidence to back up their claims. How, then, can you quickly and reliably figure out that one product is better for the planet than another? The solution is to look out for eco-labels—recognizable, reputable symbols that guarantee a basic level of environmental friendliness. What are eco-labels and how do they work? Let's take a closer look! 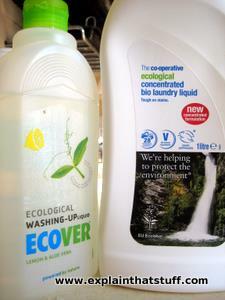 Photo: Two bottles of eco-friendly washing detergent. Note the use of natural imagery (flowers and leaves on the left; a waterfall on the right). The bottle on the right carries the EU Eco Label—an objective guarantee of its environmental credentials. 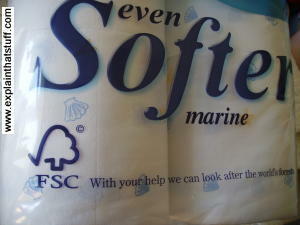 Photo: The FSC logo helps you to spot wood and paper products that come from "well-managed, sustainable forests"; choosing products marked this way means you're not contributing to damage in threatened areas such as tropical rainforests. An eco label is a trustworthy symbol that manufacturers can put on the things they sell to demonstrate that they are genuinely better for the environment than comparable products. Most eco labels are voluntary: canned fish producers might apply for permission to use a label from the Marine Stewardship Council (MSC) showing that the salmon they catch meets its standards of sustainability, while timber producers might ask for certification by the Forest Stewardship Council (FSC) to prove that their wood hasn't come from a tropical rainforest. Other eco labels are mandatory: for example, in North America, manufacturers of cars and major household appliances are obliged to label their products to show how energy efficient they are; in Europe, makers of major electrical appliances also have to display a label containing an A–G rating (A is good, G is bad) showing its level of energy efficiency. Photo: Fish stocks are dwindling in many of the world's seas. The MSC logo is meant to help you find fish from well-managed, sustainable sources, which means threatened stocks get a chance to recover. Even big, well-known labels like this have their critics. There are many different eco-labeling schemes in operation around the world, each covering a different range of environmental criteria. Some labels are very narrowly defined: for example, a label that reads "100% recycled" tells you only that a product has been made from recycled materials; it doesn't guarantee the factory where the product was made produced no air pollution, used no child labor, paid its workers fairly, or didn't transport its goods by environmentally damaging air freight. Other labels seem narrowly defined but implicitly include broader standards of environmental performance. For instance, if you buy organic food in the UK that's certified by a body called the Soil Association, you're guaranteed not just that the food was grown without pesticides but also that any animals involved in its production were treated humanely. Some labels, including the EU Eco Label, certify good environmental performance across a much wider range of criteria, including the use of raw materials and energy, the degree of recycling and reuse, whether air, water, or land pollution was produced during manufacturing, and so on. For eco-labeling to work, it's essential that labels appear only on products that meet the standards they advertise. In practice, that means product manufacturers have to apply to some independent certification authority for a licence to display a label, which is granted only if their product meets specific criteria. Often, manufacturers have to pay a fee to cover the cost of administering the scheme and are granted permission to use a label under the terms of a legally binding contract. Ecolabels offer three major benefits. First, for consumers, they're a shortcut to doing good: they're an easy-to-use, trustworthy guide to products that help the environment in some way. If you're racing up and down your supermarket, quickly trying to decide what to buy, looking out for products that carry an authoritative, recognizable symbol like the EU Ecolabel is a fairly dependable approach. Second, for manufacturers, ecolabels offer a potential point of difference and a competitive advantage. Many consumers take environmental performance into account so if a product looks eco-friendly and doesn't cost much more, it's more likely to be lifted off the shelf. For manufacturers, making eco-friendly products can make commercial sense. Photo: One of the world's most trustworthy and rigorous eco-labeling schemes, the European Union (EU) Eco Label is partly designed to stimulate the market for eco-friendly goods. Third, labels encourage a general raising of environmental performance, even among products that aren't labeled. According to the International Standards Organization (ISO), the body that guarantees worldwide uniformity in the way we measure things, the objective of ecolabels is: "...through communication of verifiable and accurate information, that is not misleading, on environmental aspects of products and services, to encourage the demand for and supply of those products and services that cause less stress on the environment, thereby stimulating the potential for market-driven continuous environmental improvement." In simpler words, if environmentally friendly products sell better, all manufacturers have an incentive to produce them—and standards rise overall. The biggest problem with a growing interest in ethical shopping is that manufacturers may be tempted to make exaggerated or misleading claims, which confuse consumers into thinking products are better than they really are. Instead of raising standards, the result is confusion among consumers and a systematic undermining of all eco-friendly products (including genuine ones). This, of course, is exactly the problem that properly certified ecolabels are designed to solve. For the system to work, eco-labels need to be trustworthy, trusted, simple to understand, and easy-to-recognize. 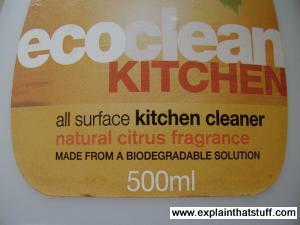 Trust genuine ecolabels, but try to make sure you understand what they mean. If you care enough to shop ethically in the first place, care just a bit more and ensure your money really is making the difference you want it to make. Do some research online. Find out where your products actually come from, how they're produced, and what steps manufacturers have taken to clean up their act. Don't automatically assume that unlabeled products aren't environmentally friendly. If you have time, try to make really informed decisions about what you buy by researching in helpful magazines and websites such as Ethical Consumer. How to use eco-labels—ten top tips! Photo: Vagueness is bad: This "ecoclean" detergent claims to be "biodegradable", but doesn't define what biodegradable actually means. Most things are biodegradable eventually, even plastics that take 500 years to disappear: the important thing is how quickly something breaks down in the natural environment. Fortunately, this product comes from a very reputable manufacturer, so my inclination would be to telephone them and ask for more details. I'd also suggest to them that they include specific details on the packaging: if the product is as good as they seem to be suggesting, why not simply substantiate the claim? Do your research: Find out a bit about the main, trusted eco labeling schemes used in your country (some are listed below) and learn which ones apply to the products you buy regularly. Look out for those labels when you shop and you won't go too far wrong. Specifics are good: Concrete claims made by trusted manufacturers ("100% recycled") are usually trustworthy, though they may not tell the whole story (see also point 7). Vagueness is bad: Vague or unverified claims ("natural," "eco-friendly," "good for the planet," "kind to your skin") are worthless. Buzzwords like "organic" are also meaningless if they're not properly substantiated: unless a product is certified as organic by an independent authority, don't assume that it is. Beware of greenwash: Is a manufacturer making a real commitment to the environment or just making loud claims about a product that represents a relatively small part of their sales? Oil companies have been regularly accused of this. They run huge advertisements for their tiny solar energy research efforts, implying a huge commitment to the environment, when the vast majority of their business still comes from unsustainable, fossil fuels. Misleading claims: If a manufacturer can't honestly represent their product as eco-friendly ("We use 100% recycled packaging"), they may try to misrepresent it instead ("Our packaging is 100% recyclable"), purely to jump on the green bandwagon. Photo: Top: Meaningful: You can tell that the manufacturer of this red cardboard box is making an effort to reuse waste materials: the cardboard is "85% recycled"—a clear and specific claim. Bottom: Meaningless: This green label gives a misleading impression that the product is environmentally friendly—when it most likely isn't. "100% recyclable" doesn't mean the same thing as "100% recycled": the first simply means you, the consumer, can choose to recycle the product if you wish (or trash it if you don't), whereas the second is a specific statement that the manufacturers have made a genuine effort to reduce waste. If the makers were using recycled board, you can be sure they'd say "100% recycled" instead. "Made from renewable resources" is another meaningless statement. What exactly does "renewable" mean in this context? Have the manufacturers made a special effort to plant as many trees as they cut down? 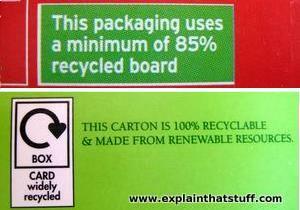 Or do they simply mean cardboard is renewable because it comes from trees? Irrelevant claims: No food manufacturer would get away with packaging that said "We don't put poison in our products," but manufacturers often say things like "Not tested on animals" even in countries where animal testing is prohibited by law. What else is wrong? : Just because a manufacturer gets one thing right, doesn't mean they deserve your custom. When you buy something advertised as "100% recycled," thinking you're doing good, are you actually buying cheap trash made in a sweatshop that's flown halfway around the world in an environmentally damaging way? If a manufacturer is really committed to the environment, they'll try to minimize all their environmental impacts, not just one of them. Eco-labels like the EU Eco Label are a good sign that a product manufacturer is taking much more than a token interest in the environment. Less is more? : Lots of eco-products are sold on the basis that they do less harm than conventional alternatives, but "less bad" doesn't necessarily make them "more good." You could opt to use "less bad" eco-friendly detergents, but you could cut out some detergents altogether by using microfiber cloths, which would save money and keep chemicals out of the environment. Keep things in perspective: It's great to be an ethical consumer, but bear in mind the bigger picture. Suppose you agonize for an hour over whether buying recycled envelopes is better than buying non-recycled ones—you're making relatively little difference to anything. Instead, target your efforts where they'll have more of an effect: why not spend an hour writing a letter to a local newspaper or starting a campaign to change something for the better? Put them on the spot: Don't be afraid to ask manufacturers for more information about their products: you'll find that many products have customer inquiry email addresses and telephone numbers on them for precisely this reason. Photo: Eco labels vary from country to country. 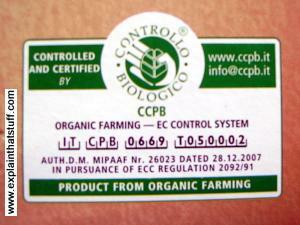 Controllo Biologico is a certification/labeling scheme you might see if you buy organic food produced in Italy. Note how specific this label is: it gives the precise certification number of the product. EnerGuide:Canadian government energy efficiency label. EnergyGuide: US government energy efficiency labeling for large appliances. Energy Rating Label: Australian government energy standards. EU Eco Label: Broad range of environmental criteria. EU Energy Label: Rates electrical appliances on a broad efficiency scale from A-G and gives information about other aspects of environmental performance, including noise, water use, and so on. Fair Trade Foundation: Fair trade tea, coffee, sugar, and other commodities. 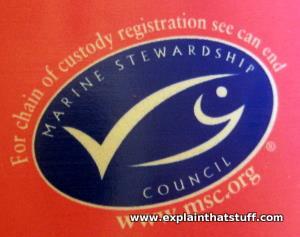 Marine Stewardship Council (MSC): Certification of sustainable fisheries. Nordic Swan: Long-established Scandinavian eco-labeling scheme. Soil Association: Organic food standards in the UK. FTC Green Guides: The Federal Trade Commission's official guidelines on how to ensure environmental claims for products and services are accurate and don't mislead consumers. The Sins of Greenwashing: A study of environmental claims in North American consumer markets: by TerraChoice Environmental Marketing Inc. When TerraChoice examined claims made by 1,018 products, it found "all but one made claims that are demonstrably false or that risk misleading intended audiences." We label fridges to show their environmental impact—why not food? by Joseph Poore, The Guardian, October 10, 2018. Should packaged food detail things like how much water and energy it needed to produce? Enjoy cod's revival, but the extent of our ruination of the sea remains unknown by Mark Kurlansky. The Guardian, July 23, 2017. The MSC label has helped to restore cod stocks to sustainability.... or has it? 'Wild west' of eco-labels: sustainability claims are confusing consumers by Lucy Atkinson. The Guardian. July 4, 2014. Do we really need 455 different eco-labeling schemes? F.T.C. Issues Guidelines for 'Eco-Friendly' Labels by Edward Wyatt. The New York Times. October 1, 2012. The government guidelines for green marketing have been updated for the first time in 14 years. Questioning and evolving the eco-label by Patrin Watanatada, The Guardian, March 10, 2011. Do eco-labels work—and how should they change to reflect growing consumer awareness? Sustainable fish customers 'duped' by Marine Stewardship Council by Lewis Smith, The Guardian, January 6, 2011. How the MSC has come under fire for certifying fisheries some consider unsustainable. The deflowering of the EU's green logo by Fred Pearce, The Guardian, April 15, 2010. How an EU eco-label found its way onto rainforest timber. Can eco-friendly fish be big in Japan?, BBC News, February 26, 2010. How MSC certification has attempted to make industrial-scale fishing more sustainable.